Find out how InLoox PM helps you achieve better project results through enhanced documentation. At InLoox, we believe that project documentation should not cause anyone involved additional work but instead should happen easily and comfortably as the project runs. Our motto "project documentation en route" means for you: minimum time effort, maximum benefit. InLoox PM simplifies and optimizes the consistent process of project documentation, giving you more time for what's really counts — your clients and successful project delivery. 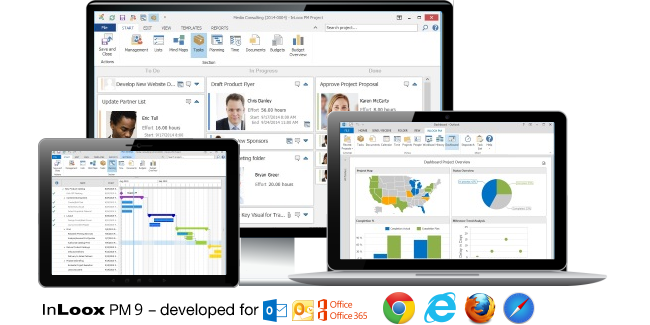 Imagine a software that is easy-to-use and integrates perfectly into a program that you already use the most in your everyday work — InLoox PM for Outlook. Our software is conceptionalized along your daily workflow and reflects the natural process chain of your projects. 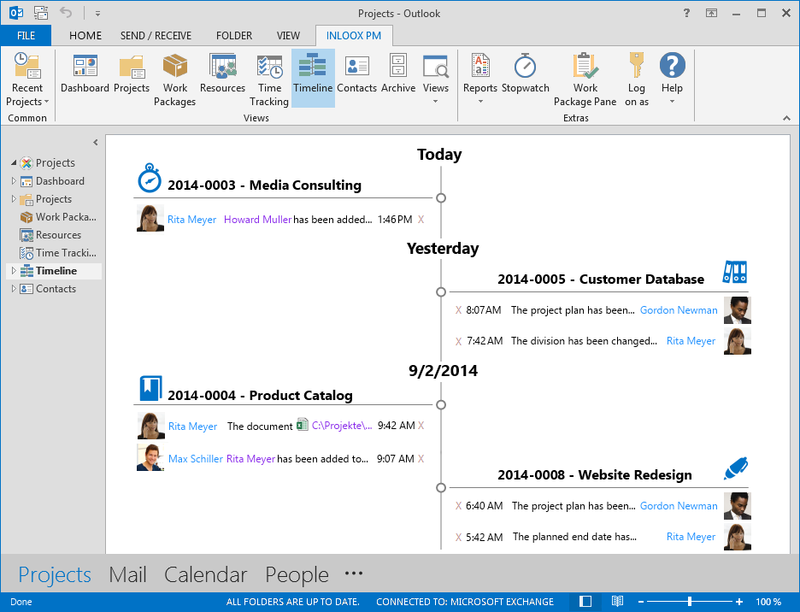 You can document work hours and tasks you completed for specific projects directly from anywhere within your Microsoft Outlook program, for example directly from whithin your inbox. Attachments to your emails are automatically linked with the respective project and everyone who work on the same project and has the relevant permissions, can easily access the information. No more tedious searching for project information on your file system and important project related information is no longer being lost in your inbox. In order to achieve successful project delivery it is important that everyone involved is aware of the project's status quo, work backlog and relative progress. This provides not only planning security to the project manager but helps the team to effectively prioritize for an efficient completion of their workload. Only if changes to the project are being consistantly documented can everyone be sure to base their decisions on the most up-to-date project information. Working on outdated versions of construction plans, completing market tasks that are no longer relevant is frustrating for the team members and leads to an unnecessary waste of limited resources, at times adding up to quite enormous cost factors. A consistent project documentation practice also facilitates better communication with the customer. Documenting cases such as adjustments to the project schedule due to a delay in material delivery or changed customer requirements helps to pave the way for constructive project debriefing. Moreover, project planning and management heavily depends on experience from previous projects. In order to have a successful "lessons learned" in the end of a project, mature project documentation is a must. 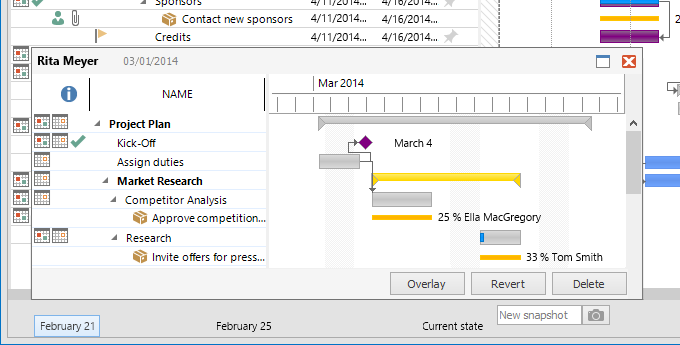 With InLoox PM for Outlook you are always up-to-date on the project status of all the projects you work on. All project related information that you add is automatically documented, creating a tracable activity history for later reference. Changes you make to individual elements in the project plan, like activities, work packages, resources and time tracking entries, are automatically assigned to respective team member. The InLoox PM project management tool also offers a full text search accross your entire project database. With this easy and comfortable feature you can quickly find all the project related information you need. The clever permission settings ensure that only authorized team members get access to sensitive data while using the same storage platform and this makes sure that the information you access is up-to-date. You can add notes to almost every project element that provide detailled information on the last changes you made or things you still want to complete. The note feature is also a great way of communicating with other team members on specific task or piece of project information. Thanks to the automatic documentation concept, you can create a complete project history without any additional effort for the project manager or the team members. After the completion of the project, the project documentation expands your corporate knowledge base and others can make profitble use of your experiences. How often did the "undo" button in Microsoft Word or Excel save your work life from misery? It is a great relieve that if something went wrong you can go back to a previous state of your work at the click of the button, saving you possibly hours of redundant work and frustration. This is now also possible with the InLoox Snapshot feature. This easy-to-use feature allows you to save a complete record of the status of your project plan and all the elements it entails. You can compare historic project snapshots with the current project status and, if necessary, restore previous staus's of your project plan. Discover how InLoox can streamline your project documentation. Project Documentation Made Easy with InLoox • Copyright 1999-2019 © InLoox, Inc. All rights reserved.